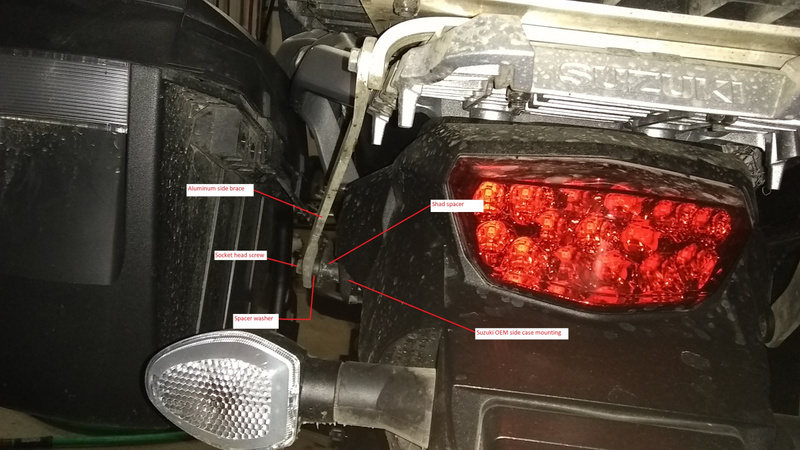 Stromtrooper Forum : Suzuki V-Strom Motorcycle Forums > Popular Forums > DL1000A - 2017+ > What top case for two up? I have an 07 V with stock top/side cases. My son rides with me and complained about how tight the top case made the ride. 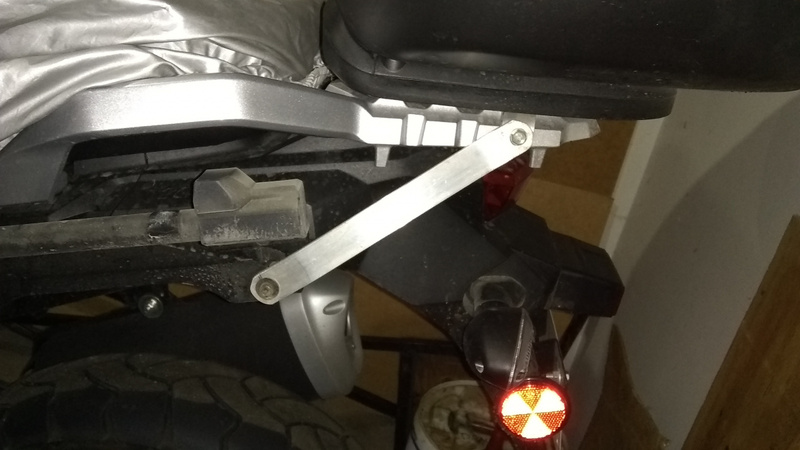 So I fabricated a metal bracket and remounted the top case 2.5" to the rear of the bike. 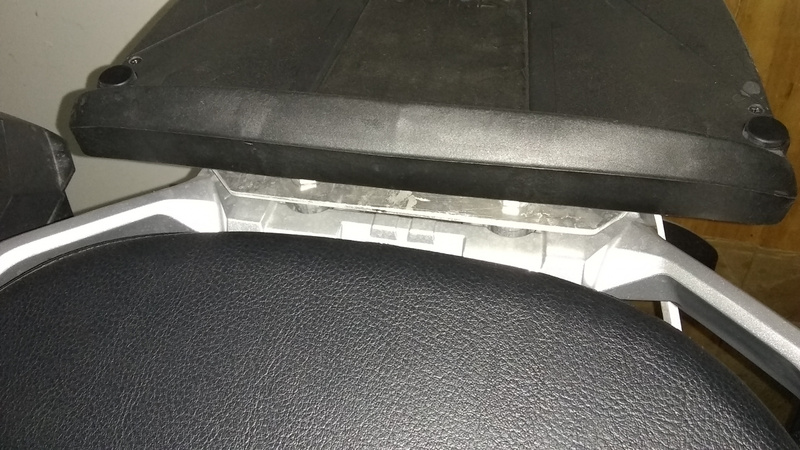 One note: I noticed if you cannot remove the seat without removing the top case, then the top case is too far forward (especially for passengers). I would worry about that pushing forward thing with most top boxes. I remember reading a long time ago of a guy who had to build a custom plate to hold his top box, just to satisfy his wife. I guess she was a little larger around the middle, or maybe he was larger around the middle, and she was getting a bit squished. One idea is, add a Givi plate, then rig up some kind of back rest to it, so your wife can test it, before you buy any top box. Sort out the needed distance first. If you get a decent back rest, maybe you won't need the top box at all. Next problem is, if you want to fit two helmets inside a top box, it is going to need to be a really large box. I doubt those shad boxes would fit an xxl and a medium at the same time, but I could be wrong. You might need to go to a 58l to fit everything. I have the Shad SH48 top case with the pad kit and the Shad SH23 side cases. I built my own adapter plate and side braces for the rear rack. (absolutely, YES, add some bracing to the OEM rear rack because it's a flimsy thing.) In all, it's a pretty good set up. My wife is 5-8 with long legs. She is not cramped with the rear case. Keep in mind that even with the SH48 and backrest, your XT will not be comparable to a Goldwing or other nicely appointed bikes. 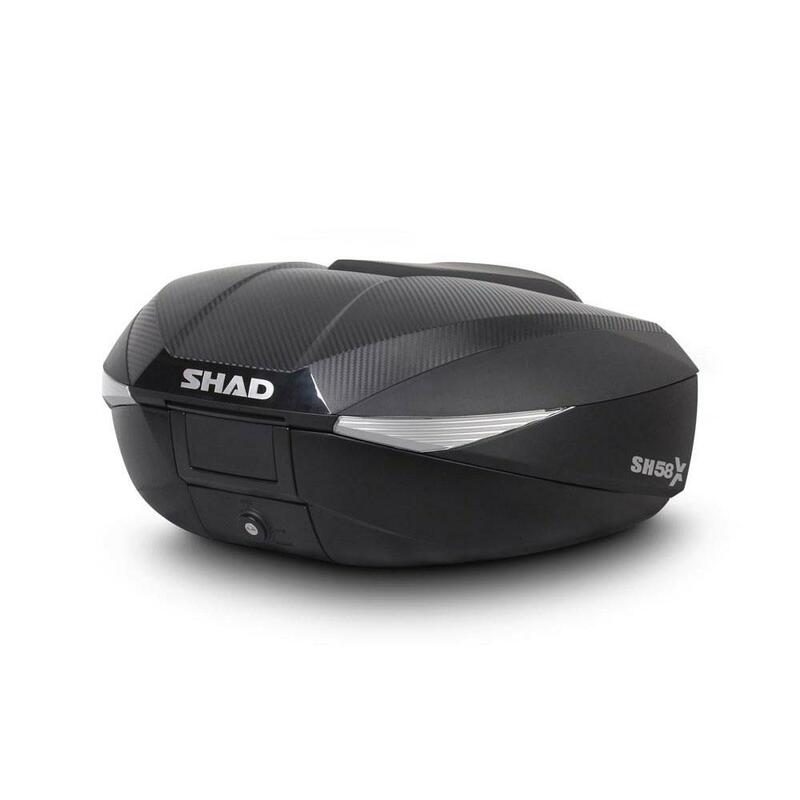 a- The Shad top case can be opened & latched without locking/unlocking the latch set. It can be locked only when I want. b- The side cases are top loading, and very sturdy. c- The Shad side rack mounting system is a very positive lock- much more secure than the Givi system which I had on my past 650.
d- The top of the Shad side cases are a little bit lower than the Givi cases. e- The Shad side cases are supplied with an extra key lockset so that the top case will use the same key as the side cases. f- The SH48 passenger pad set is the best I found when shopping. On the downside, the Shad side case mount system is sort of a contraption where it mounts to the upper sides of the bike. The kit comes with fairly long spacers which cantilever the screws too far out. In the event of a tip over, parts could get bent. I should think of some better bracing maybe. Not sure if the Givi system is any better though. 18 1000 XT yellow. Bunch of goodies installed. Previous rides- about 25 different bikes, mostly dirtbikes. Last edited by Bazooka Joe; 03-24-2019 at 03:26 PM. Bazooka Joe. Do you have any pics of additional bracing you put in? Thanks for the pic, it helps since we have same color of bike. I like how the Givi mount has the side bracing. Will I have problems if I don’t do the additional bracing? Anyone? Between the Shad 48 and the Givi 47, are my chances slim that I can get 1 medium modular and a xxl modular in there? You have to be careful in loading a top case ...that said I've owned several, overloaded them all and never had an issue with standard mounting brackets. The expandable Shad I think handles two helmets. Sure- Here's some more pics to show how I did mine. My adapter plate is 1/8" aluminum and the side braces are also aluminum. Your connection to the side case mount will probably be different though. I rode for a while without the side braces, but the rack is pretty flimsy and the case bounced quite a bit. I think at some time, the rack would eventually crack- the rack is only made of tough plastic. Pretty sure you can get the helmets in there. I'll try tomorrow with a couple of XL full face helmets and report back with a picture. Last edited by Bazooka Joe; 03-24-2019 at 10:35 PM. Bazooka Joe. Thanks for taking the time with the pics. Gives me a better idea of what would need to be to done to make it a solid set-up. In a perfect world it would be nice to have the Givi mount with side braces (no fabrication needed) and then be able to use the Shad top case. I do like you set-up with all the Shad bags. I just need to figure out if I want to figure out where to get the aluminum brave work done. Appreciate you checking on if two helmets will fit in top case. I really think you are over thinking it...top cases are not designed for heavy loads and Shad engineers their fitments very well. 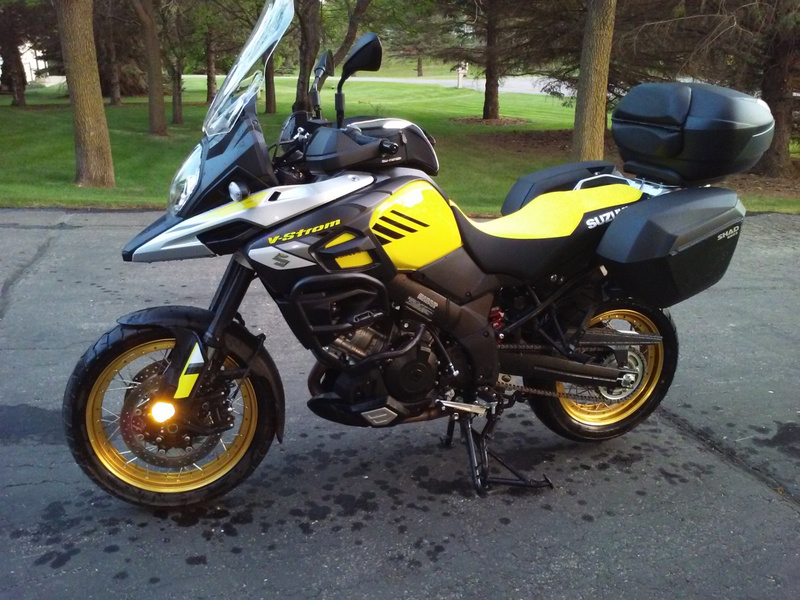 That's a solid rack on the Vstrom as well unlike some of the bikes like mine with no rack at all. This is a really good top case for your requirement for two helmets....it expands and I think you'll find the Shad mounting system top notch. I don't know about front to back adjustment ....you could email Shad support....they've been very good. Last edited by Macdoc; 03-25-2019 at 03:56 AM. Imho if the top box is lightly loaded the standard carrier unbraced might be ok. 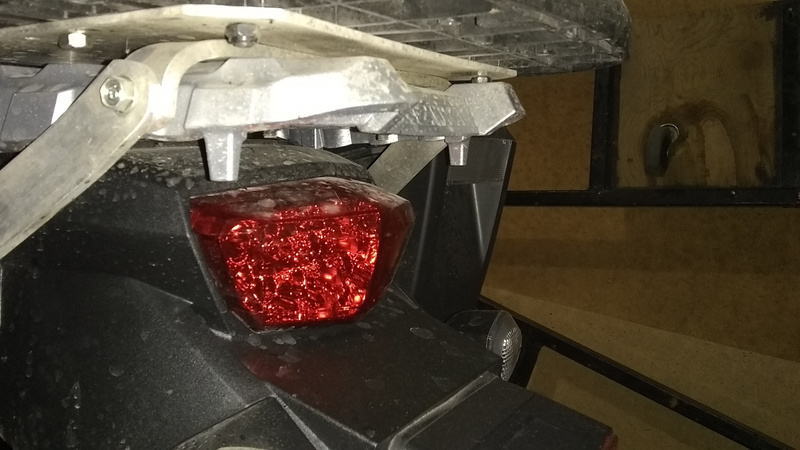 When I first mounted a top box on the Strom carrier I tested the box mount by straining it against the mount and I was immediately surprised at the extent to which the carrier flexed. Long term over rough roads even lightly loaded I believe that carrier could eventually break. Under no circumstances would I carry a pillion who uses the topbox as a backrest without bracing. As such I believe braces should be employed either home made like Bazooka Joe's or branded.